Gun maintenance essentials for all kinds of guns . This kit is a handy set of cleaning supplies to augment your primary caliber-specific tools. The Winchester Gun Cleaning Kit is specially formulated to effectively clean, lubricate, and protect exposed surfaces from moisture. Recommended for: rifles, shot guns, pistols, revolvers, bolt lever actions, gun parts trigger assemblies, extractors/ejectors firing pins, safeties, gas pistons, crane assemblies, cylinder assemblies, receivers actions, magazines gas ports, chambers, barrels, choke tubes, barrel threads, slide actions, automatic parts, air guns, single shot parts, breech mechanisms, muzzle loaders, air rifles, hand guns. Wipes: Thick, disposable wipes saturated with a deep penetrating cleaner and high-grade lubricant. 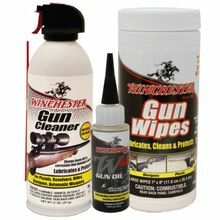 Winchester Gun Wipes break loose dirt and corrosion that damage firearms and leaves a corrosion-protectant coating. Winchester Gun Wipes are the quickest, easiest, and most effective way to maintain your firearm. Gun Cleaner & Lubricant: Winchester� Gun Cleaner & Lubricant is a specially formulated deep penetrating cleaner, lubricant that cleans gun actions without disassembly. Contains a high grade lubricant for smooth reliable operation of firearm parts while leaving a corrosion-protecting coating for maintaining fine firearms. Gun Oil: A blend of the finest ingredients available. Designed to provide excellent corrosion protection. Warranty: One year from Winchester. Made in the USA.